It's been a few years since The Signal (review) director Jacob Gentry made a big splash and though he's kept busy, we've been waiting for his return to sci-fi and that return looks like it's going to be a winner. 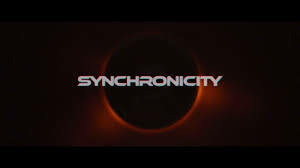 Described as a "mind-bending 'Sci-fi Noir' in the tradition of Dark City, Blade Runner, and Alphaville" Synchronicity stars Chad McKnight as Jim Beale, a physicist who creates a time bending machine and then falls in love with a girl he also thinks is trying to steal his invention. Paranoia much? Along with McKnight, the movie also stars Brianne Davis, AJ Bowen and the ever awesome Michael Ironside. This first clip from the movie doesn't provide much in the way of story but it certainly sets a great precedent for the movie which is looking great. Fingers crossed we get some release news coming out of Fantasia. Fine line between Blade Runner homage and complete ripoff. This is very much on the wrong side of that line. Especially with that soundtrack. Why is The Signal so underrated to this day? I'll check this out based on my love of that film alone. And Ironside of course. Having a sort of Vangelis-sounding soundtrack for a trailer does not make one's film Blade Runner esque. Please.